How to Uninstall Yahoo Search? Home »	Uninstall » How to Uninstall Yahoo Search? Issue: How to Uninstall Yahoo Search? All of a sudden I found Google search engine replaced by Yahoo Search. The default start page is set to Yahoo and the search engine is search.yahoo.com. I’m not sure, but it might be that I installed it by accident. I tried to remove it, but it reappeared when I reopened the browser. Please help. 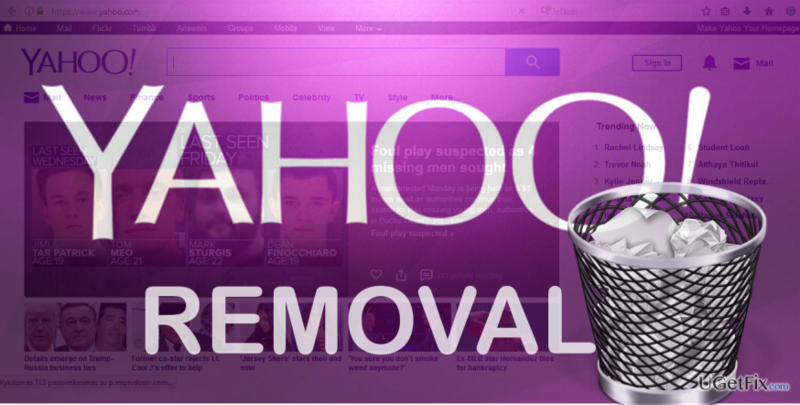 Why Internet Users Opt for Yahoo Search Removal? Is Yahoo Search a virus? Yahoo Search is a legitimate search engine developed by Yahoo Holdings, Inc. It can be directly accessed on the Internet or set as a default search engine and start page by installing an add-on. Many people like the search and they are free to use it. However, the bulk of netizens condemns the activity of Yahoo company and opt for urgent Yahoo Search removal. Although Yahoo Search and search.yahoo.com start page are legitimate, Yahoo company is often accused of initiating doubtful activities. It often distributes Yahoo Search by bundling – as a free attachment of freewares and sharewares, which are usually dubbed as potentially unwanted programs (PUPs). For example, the fact that Yahoo is distributed with Skype is well-known, so aware people simply unmark Yahoo Search engine and start page on during Skype installation setup to prevent unwanted changes. If, however, the PC user overlook Yahoo add-on, it is installed by default and, therefore, the start page and search engine on the default web browser are set to Yahoo search automatically. Although security-related forums refer to Yahoo search as a redirect virus or browser hijacker, the original version of Yahoo Search is not malicious. However, the developer is often accused of exploiting bundling distribution strategy, which is why Yahoo may get installed on any web browser (Google Chrome, Mozilla Firefox, Internet Explorer, Safari, ect.) without requiring for user's permission explicitely. Moreover, Yahoo Search and search.yahoo.com are misused by many browser hijackers. For example, if the PC’s owner installed a freeware and ends up with Delta-Homes.com, Default-Search.net, InstallX Search Protect for Yahoo, Yahoo Mail, Yahoo Startnow or another PUP, he or she starts receiving search results from Yahoo. The truth is that these search results are may be sponsored, which means that they may contain third-party ads and links. If you have found out your default search engine replaced with the Yahoo search after the installation of a third-party utility, we would strongly recommend running a scan with Reimage or another professional anti-malware. It will remove all potentially unwanted programs, including the one that the one that was bundled with Yahoo Search. 1. Right-click on Windows key and select Control Panel. 2. Open Programs & Features and check the list of apps. 3. Draw your attention to unknown and suspicious app that have been installed at the same day as Yahoo Search add-on. 4. Right-click on each of them and select Uninstall. 5. Now press Windows key + R, type regedit, and press Enter. 6. Click Edit and Search. 7. Type the name of the app that you have recently uninstalled to check for its leftovers. Remove them as well.